The Democratic National Convention is set to take place in Philadelphia, PA from July 25 to July 28, 2016. A certain lollapalooza of political, protest and party events is expected culminating in the likely presidential nomination of Democratic Candidate Hillary Clinton. Here is a look into what the protestors and party goers have planned for Philadelphia during the convention. 4 Large Scale Pro-Bernie Sanders Rallies. Global Zero March to eliminate nuclear weapons. Food & Water Watch March for a Clean Energy Revolution. ORGANIZE to SHUT DOWN THE DNC. Poor People’s Economic Human Rights Campaign. The city has designated six zones within FDR Park, across Broad Street from the arena to demonstrate. Thomas Paine Plaza in Center City. Marconi Plaza in South Philly. POLITICALFEST: an interactive festival highlighting American political history, as a way to engage the community throughout the convention. 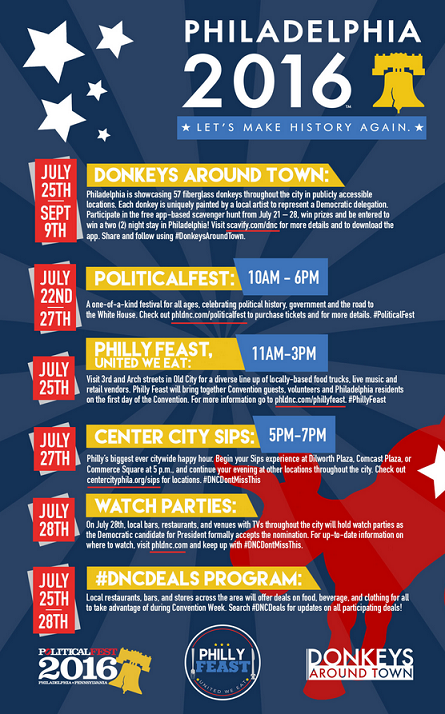 Donkey’s Around Town: Democratic National Convention Philadelphia 2016 Donkeys Around Town Scavenger Hunt. PhillyFeast: PhillyFeast will kick off the Democratic National Convention with a food truck festival fit for the City of Brotherly Love. Unity’ Party at DNC: Rapper Snoop Dogg will headline the Democratic National Convention’s “Unity Party’ for donors in Philadelphia. The event will take place at Philadelphia’s Electric Factory on July 28. If you are planning your own DNC watch party, organizing a local protest or hosting a support event then try Ennect Online Do-it-yourself marketing apps. Communicate with Ennect Mail. Gauge the political winds with Ennect Survey. Register attendees for your local political watch party or protest with Ennect Event.